Author: William John Burchell ex John Bellenden Ker Gawler 1816. 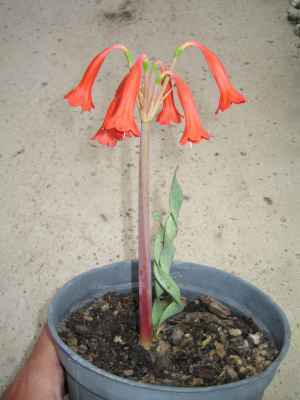 This member of the Amaryllidaceae family was described by William John Burchell after John Bellenden Ker Gawler in 1816. It is found in the Southern Africa, growing in a very well drained soil with little water and lots of sun. 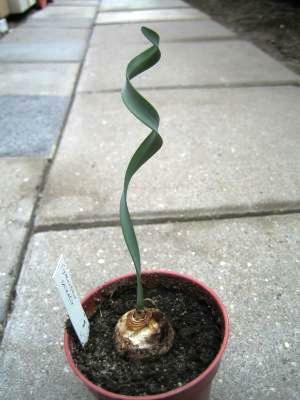 The bulb will slowly grow to four centimetres in diameter, and the few leaves to fifteen centimetres. The flowers are red or dark pink, and the plant can be reproduced both from seeds and from offsets. The genera name originates from the Greek kyrtos, meaning curved and anthos meaning flower.